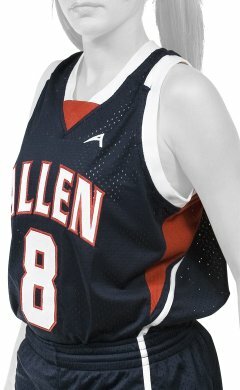 Pricing based on team order of 12 jerseys or more. 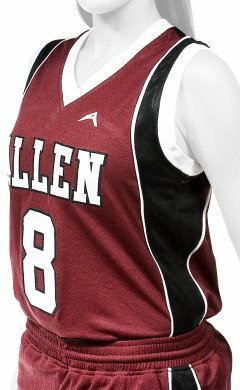 Call now for individual jersey pricing! 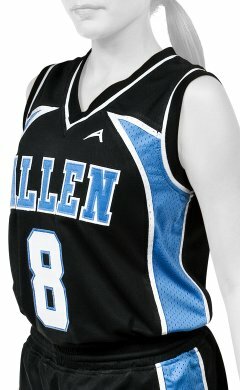 Pricing based on team order of 12 uniforms or more. 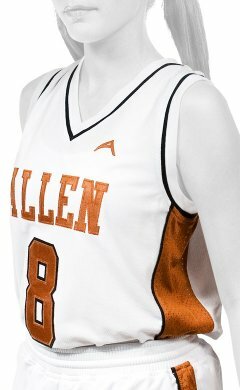 Call now for individual uniform pricing! 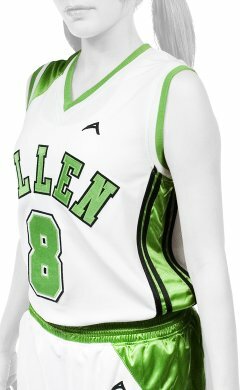 A high school or varsity sports team is not complete without high quality and durable jerseys made from the same glossy polyester fabric as professional sports teams. 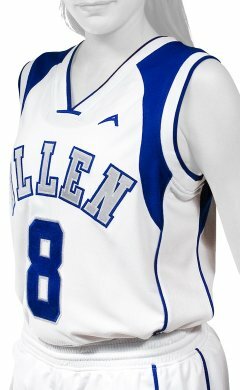 Uniforms are a must for building morale and pleasing fans, many of whom are likely to be onlooking parents. 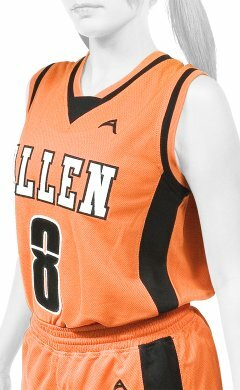 A career in high school or amateur basketball is worth a small investment in a jersery that will last the whole season and on into a lifelong trophy. Although letters are sewn onto the fabric rather than printed, many colors are available for the letters and the stripes. Gold and blue might be featured on a white background or a gold shirt might have white lettering. 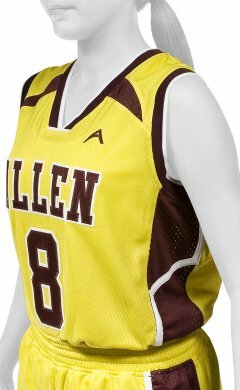 Other popular colors are blue, yellow, maroon, green and gray; these are featured in different combinations on a variety of professional Allen Sportswear jerseys. 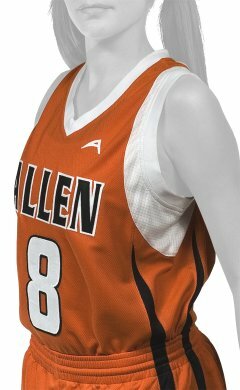 All jerseys in both the Classic and PRO categories are made from breathable mesh polyester fabric. Seams are stitched twice and will not break even when considerable force is applied. This is essential in any physical sport. 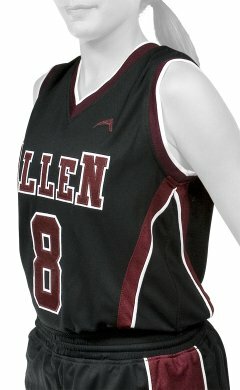 Even though basketball is not a contact sport, falls and accidental contact sometimes occurs. 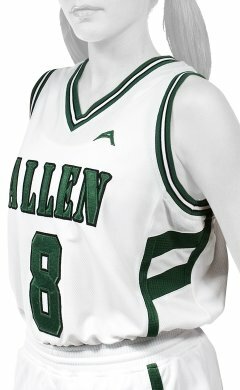 It is essential to have a tough fabric that is able to last as long as the players while permitting proper perspiration. 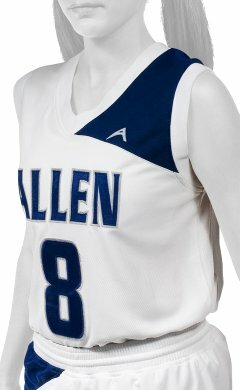 The quality of sewing is no different between Classic and Professional grade jerseys, and the fabric of both is polyester. The difference lies in color choices and the labor required to produce a more complex pattern. 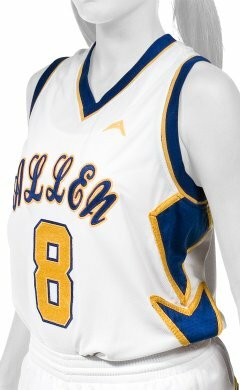 Classic varieties are similar to jerseys worn decades ago and are sufficient for teams that want to maintain a traditional flavor. Professional grade is for teams who have a complicated logo or letter design. 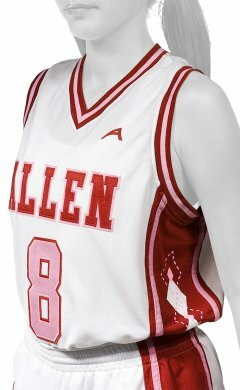 It features up to 50 colors for the jersey and two colors for letters. 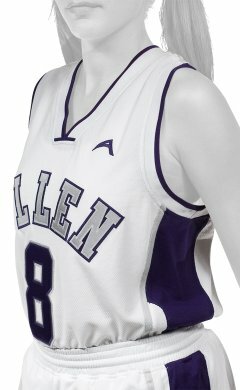 Computers have streamlined the design process and dramatically increased the options for basketball jerseys. 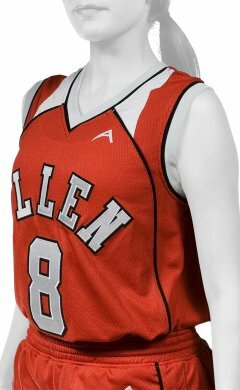 It is possible to completely design your team jersey through the Allen Sportswear website. The Draft Board application can be accessed through any jersey page, and all the options become immediately available. The first color is the solid background, the second determines the letter color and sides, and the third is the lining color. Other options include the depth of the shoulder cut, the neck shape and the ribbing pattern.